Why do a preset white balance? Please read: What is white balance if you need to understand the concept of white balance in detail. The cameras made today are extremely sophisticated and they can judge pretty accurately what kind of photograph is being shot under what lighting conditions. But sometimes, you need to give them a little push so that they are able to serve you better. If you feel that your photographs are too warm or too cool for your taste, maybe it is time for you to do a custom white balance or as Nikon calls it - preset white balance. We are going to take a look at the easiest, cheapest and fastest way to white balance Nikon cameras. If you want to know about custom white balance on Canon cameras, please read this article here. White balance is nothing but getting rid of the colour casts on your photographs by telling the camera, "Hey! This is white! Please make other adjustments accordingly!" So logically, the easiest way of doing this is by showing the camera a piece of white paper and telling it that this is white. Different cameras have different ways of measuring white under different lighting conditions, though internally the process remains the same. Nikon calls this adjusting the PRESET white balance and it is done by pressing the WB(white balance) button on the camera and turning the command dial until the display show "PRE". You then release the WB button and press it again. The PRE now begins to flash. This means that the camera is in ready mode to take the new white balance setting. Now all you need to to do is put a white paper in front of the camera and press the shutter button while the PRE is still flashing. The display should read "GOOD" which means your preset white balance was successful. The white paper should fill the entire frame - nothing else should be visible. If you are shooting a wide shot, zoom in to the white paper or move closer to the paper. Do not get the paper close to the camera as the light falling on the paper has to match the light falling on your subject. Get the camera closer to the paper instead. If the camera is hunting for focus, switch to manual focus. It will not make a difference if the paper is out of focus to take the white balance reading. If the camera displays "NO GOOD" that means that the camera was unable to get a proper reading. Check if your exposure is correct. Underexposure or over exposure might cause a bad reading. 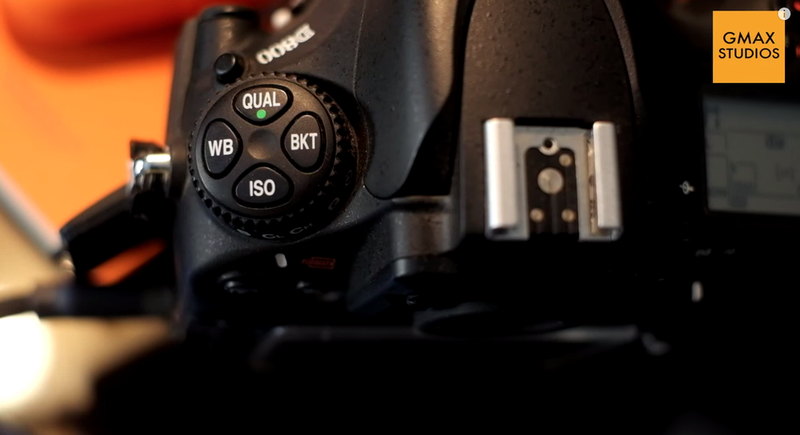 Make sure that the PRE is flashing when you press the shutter button. Please watch the short video below to understand this process better. If you have any questions, please ask them in the comments and if you like the video, please subscribe to our channel by clicking here. Please ask any questions that you might have in the comments section below. Please share this article with your friends if you found it useful. When you learn photography, it is easy to get confused between the various modes on the camera. I shoot on A aperture priority mode on my camera 99% of the time (see Aperture).The main reason I do this is because I don't shoot too much of action and sports and thus find no reason to switch to S, shutter priority mode. I also like to control my depth of field or DoF as it is known. In easy terms, depth of field refers to how blurred out your background is, compared to the focus point. This is controlled by the aperture. I shot the image below on an aperture setting of 1.8 on my camera. The camera automatically set the shutter speed to 1/160th of a sec. The focus is on Kai, the red Ninja. Notice, that though the difference between the team members is only inches - they have been arranged slightly one behind the other - the policeman, appears to be blurred. The focus gently blurs from Kai, to the policeman's handcuffs and the dog Tommy and Zane, the white Ninja are completely blurred. For the next shot I changed the aperture setting to f4. The background is gradually beginning to come in focus. The policeman is happy now. Let us stop down the aperture a bit more as in, make it smaller by stopping it down to f8. We see that more of the background is coming into focus even though the main focus point still remains the same. If we make the aperture even smaller by closing it down to f11, the background is almost completely in focus. The eyes of the white Ninja are almost sharp too. You can also make out the form of the chair at the dining table. which was not the case at all when we were shooting at f1.8. Also notice how the stitching on the dining table is in focus BEFORE and AFTER the focus point. The higher the number of the aperture, more of the background will be in focus. This can be summarised by the graphic below. You can download a hi-res version of this graphic to your computer or smartphone by adding us to your Google Plus circles. Also watch the video below to understand this concept better and see a practical demonstration of how aperture affects photos and depth of field. If you like the video, please consider subscribing to our channel by clicking here. Shoot me your questions in the comments or leave your suggestions as to what articles or videos would you like to see next.